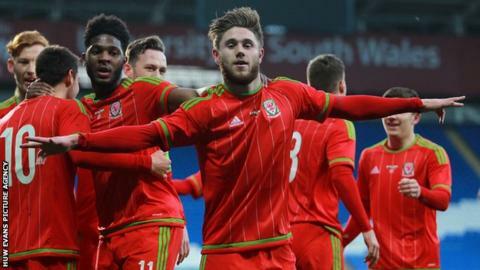 Wales Under-21 kept up their 100% record in their 2017 European Championship qualifying campaign with a 3-1 victory in Luxembourg. Bristol City's Wes Burns led the way with a brace of goals scoring either side of half-time, with Harry Wilson claiming Wales' other score. Dejvid Sinani claimed a consolation for the hosts deep in time added on, but the goal came too late. Wales beat Bulgaria 3-1 in their opening game of Group 5 in March. Manager Geraint Williams' side will also face Romania, Denmark and Armenia with the nine group winners qualifying for the finals in Poland and the four best runners-up advancing to the play-offs. Match ends, Luxembourg U21 0, Wales U21 0. Second Half ends, Luxembourg U21 0, Wales U21 0. Second Half begins Luxembourg U21 0, Wales U21 0. First Half ends, Luxembourg U21 0, Wales U21 0.